This past weekend we had a triple header! Friday night, we had the honor of photographing a wedding for a Samantha & Patrick (I’ve known Sam since I was in DIAPERS!). They chose to exchange vows in North Beach, Maryland right on the water and it was BEAUTIFUL. This Herrington On The Bay wedding will transport you to a tropical island – I swear it! Their ceremony space was just to die for and the ballroom that they partied in all night long was RIGHT on the bay! Pair that space with some awesome decor, uplighting, and a huge chandelier, how could you not be in awe?! I mean, when you just LOOK at Patrick and Sam, you can just tell that they are best friends! They have so much fun together and we could tell just by that answer to such a simple question alone that their wedding day was going to be amazing and a BLAST. Their first look was AMAZING. We kept laughing because half of the time we didn’t even direct them with posing – they just were naturally so cuddly and loving. You can see the passion and love that they share now and we know that when life gets busy with family, kids, jobs, activities they will always remember what brought them together in the first place and no matter how hard life gets they wouldn’t want to go through it with anyone else! We can’t wait for them to start posting pictures from their honeymoon because they are going to THAILAND for THREE WEEKS!!! Can you say, DREAM HONEYMOON?? 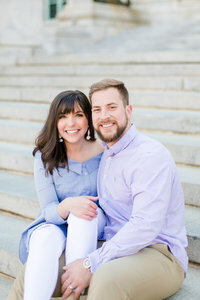 They are going to have so much fun and it makes us even more excited to photograph them again on their one year anniversary! A huge thank you to the vendors that we had the pleasure of working with on Friday night! Sam & Patrick, we love you both dearly and can not wait to see you again soon. You two are the definition of true love and we can’t wait to watch you both and see how you will grow in this crazy thing called life and marriage. Congratulations!! Cheers!